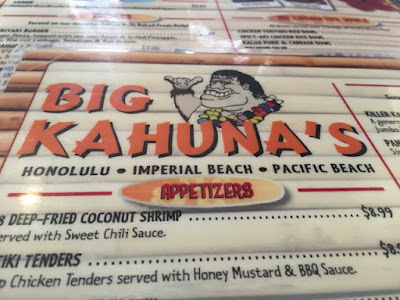 This is a mini post for the single meal I had at Big Kahuna's in Imperial Beach. We had family in town and they wanted to go somewhere that was not a fast food restaurant, that was close to their house in IB, and good for groups and children. I found Big Kahuna's on Yelp and told everyone where to meet. Big Kahuna's is located in the shopping center to the left just before you enter the 75 highway onto Coronado Island. Given that my parents (and my son) are picky when it comes to dining out, this was the perfect place to go since they have an array of Hawaiian plates and dishes. Hooray for steamed rice and saimin (ramen noodles)! I love Hawaiian plate lunches, mainly because they remind me of the plates my mom used to make us when we were growing up. We always had steamed rice, a meat (like chicken adobo, beef steak, lumpia), and macaroni salad or coleslaw. 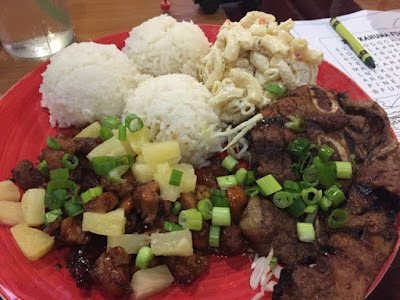 At Big Kahuna's, I ordered the Chicken Teriyaki and Kalbi Ribs (short ribs) combination Hawaiian plate ($10.95) so J and I can share. What I loved about this plate is that the chicken teriyaki came with bits of sweet pineapple. The addition to the scallion (green onion) makes every dish even better to give it that mild onion bite. Both meats were grilled really well and they were so flavorful. The macaroni salad was good and not overdressed with mayonnaise. Three scoops of sticky rice were more than enough for one person, but because J and I were sharing, it was a good portion. If you are ever in Imperial Beach, I suggest coming here for a plate lunch before hitting the beach and pier. It's also near Stardust Donuts (if you're lucky that they are open, you have to get the best glazed yeast donuts in San Diego!). On our next Stardust run (we've struck out lately) I'll have to check this place out! I agree, green onions make everything better! Golly that is a lot of rice, haha. Hey M! Oh my goodness, we always strike out at Stardust, too! My dad used to bring us donuts from here all the time growing up so I am happy it is still there. Oh yeah, we're talking about Big Kahunas, haha. Yeah, they give you tons of rice - getting two meats makes the dish shareable! They also have a Big Kahuna Burger, like the one referenced in Pulp Fiction. I always see this place and wondered about it. Now, my husband, daughter and I have to try it out! I wonder if they got their name from Pulp Fiction. Bert and I would always joke about the name. As for Stardust, it's like you have to go at a magic time or something. I love their chocolate donuts with chocolate glaze. My husband loves their German chocolate buttermilk bar. I don't think I've seen that donut anywhere else. Hi CC, haha, that's so funny. They probably did get the name from Pulp Fiction! I know, magic time is right. Lately, we seem to be striking out a LOT. It's like we need to take a day off from work just to go. M thinks they don't open until 10am, from what he remembers from the random sign on their window, but who knows, it's kind of whenever they want to open. I love how they just do what they want to do. I have to try that German chocolate buttermilk bar! I always get the same thing, either their plain glazed or their cinnamon roll donut. Otello - DuPont Circle, Washington, D.C.